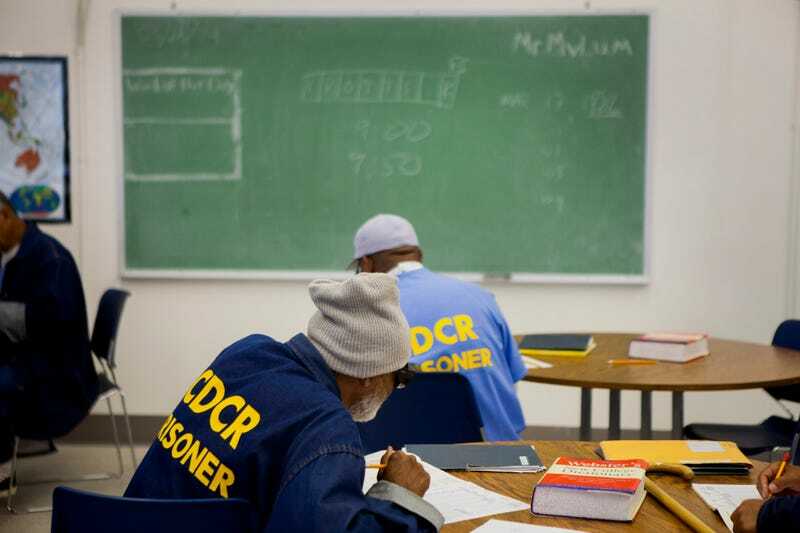 Inmates take a test as part of an educational program at the Richard J. Donovan Correctional Facility in San Diego, Calif., on March 26, 2014. Even though Congress banned providing financial aid to prisoners in 1994, as many as 12,000 prison inmates will be able to use federal Pell Grants to finance college classes next month, the White House announced Friday. The $30 million Second Chance Pell Grant pilot program, announced by President Barack Obama, will be available to inmates at 141 state and federal correctional institutions, who will be able to use a federal Pell Grant of up to $5,815 to pursue a two- or four-year degree from one of 67 approved colleges and universities. The Washington Post reports that although the congressional ban remains firmly in place, the Obama administration is using its authority to create limited experiments in the deployment of federal student aid. Prisoners must be eligible for release within five years of enrolling in coursework. King said that the funding is less than 0.1 percent of the overall $30 billion Pell program, and the pilot won’t affect funding for eligible Pell recipients who are not incarcerated. According to the Post, most of the colleges will offer classroom-based instruction at corrections facilities. Others will offer online education, or a hybrid of classroom and online instruction. Participating schools can begin offering courses as early as July 1. Roughly 37 percent of the schools will offer prison-based education for the first time. The Post cites a study by the Rand Corp. that found that inmates who participated in educational programs in jail were 43 percent less likely to return to prison within three years than those who did not. Researchers also estimated that for every dollar poured into correctional education programs, $4 to $5 are saved on three-year reincarceration costs. In the president's quest to reform the criminal-justice system, the Obama administration has also put forth programs improving education in juvenile-justice facilities and helping colleges to remove barriers to education for people with criminal records. Other recent experiments include extending Pell Grants to high school students enrolled in college courses and people participating in computer-coding boot camps. “As someone who went to college in prison and earned a quality two-year Liberal Arts degree, I know personally that providing incarcerated students with access to higher education reduces recidivism and the related costs of crime and imprisonment, and increases opportunities for employment after release,” said criminal-justice reform advocate Glenn E. Martin of JustLeadershipUSA in a statement Friday.